Thus far we have examined the 2010 ACC and Big East races through the refractive lens of SDPI. We now turn our attention to a league that will be getting a makeover when the 2011 season starts, the Big 10. Here is the link to last year's Big 10 post if you are so inclined. As usual, this first paragraph will explain how SDPI is calculated. So if you want the meat of this article skip on down. In the 2010 Big 10 regular season, conference play only, the average Big 10 team gained and allowed 3034.91 yards. The standard deviation for yards gained (offense) was 410.32 yards. The standard deviation for yards allowed (defense) was 478.90 yards. Iowa gained 2770 yards and allowed 2895 yards. Their offensive SDPI was -0.65 = [(2770-3034.91)/410.32]. Their defensive SDPI was 0.29 = [(3034.91-2895)/478.90]. Their total SDPI was -0.35. This number ranked 7th in the Big 10. 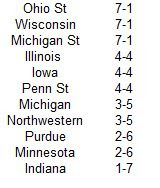 Here are the 2010 Big 10 standings. 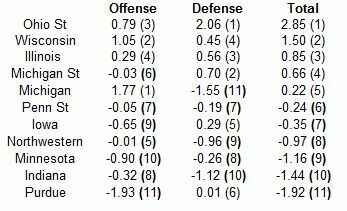 Now here are the 2010 Big 10 SDPI standings. 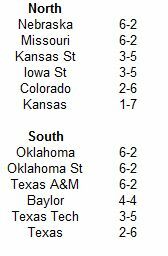 The standings are sorted by total SDPI with ranking for each category (out of 11 teams) in parentheses. While there was three-way ties at the top of the league standings, SDPI sees through the pseudo-reality and rightly crowns Ohio State as the King of the Midwest. Ohio State's lone league loss came on the road at SDPI runner-up Wisconsin. The good news going forward is that there will no longer be any more three-way ties (at least not for the privilege of representing the conference in the BCS, it could still be possible when it comes to representing the conference in the Big 10 Championship Game). Leaders and Legends, rejoice! How about Illinois? The Illini actually rated out slightly better than co-champ Michigan State. Yet somehow, the Illini did not even manage a winning record in Big 10 play. How can this be? The usual suspect, turnovers, cannot be blamed for this one. The Illini actually had a solid differential of +8 in league play. The culprit here is clutch play in tight games. The Illini played in just two conference games decided by less than a touchdown. They lost them both. Contrast that to their four league wins that each came by at least 20 points. If lady luck had been more partial to the Illini, they could well be talked about as a potential darkhorse candidate to capture the inaugural Big 10 Leaders Division. No Big 10 teams exceedingly outperformed their SDPI numbers in 2010, but if we must choose one team that was not quite as good as their record indicated, it would have to be Michigan State. While they were a shade below average on offense, the Spartans boasted the best defense in the conference this side of Ohio State. They were able to hoist (at least a share of) their first conference crown since 1987 thanks to their unblemished mark in one-score games. The Spartans were also the beneficiary of a schedule that did not include league overlord Ohio State. The Spartans proved they were not quite ready for prime time in their two losses, when they were embarrassed by a solid, but not spectacular Iowa team and again by Crimson Tide, who took out their Iron Bowl frustrations on them in the Capital One Bowl (outscored by a combined 73 points in those two games). In his swan song at Ann Arbor, Rich Rod finally fixed the offense. We'll see in a minute why despite this success, he is no longer employed. The Boilermakers won their first two league games during which they averaged 336 yards and 24 points per game. They lost their last six during which they averaged 262 yards and 16.8 points per game. The Buckeyes held six of their eight league opponents under 300 yards. Michigan gouged them the most with 351 yards. Had the Buckeyes allowed that many in every game, they still would have owned the third best defense in the league. Outside of a solid showing against Purdue (256 yards allowed), the Wolverines were incapable of stopping any team. Somewhere, Lloyd Carr is smiling. Leaders Versus Legends: Balanced Divisions? The Big 10 will be undergoing a dramatic shift beginning in 2011 when they add the Nebraska Cornhuskers from the Big 12. The addition of Nebraska means the Big 10 will move to a division format and stage a championship game the first weekend in December to determine which teams earns the conference's automatic BCS bowl bid. The names of the divisions, Leaders and Legends, leave a little to be desired, but as a famous poet and playwright once said, what's in a name? The real question is, are the divisions balanced, or will it play out like the Big 12 where the South division winner emerged victorious in the Big 12 Championship Game nine of the last eleven years. On the surface, it appears the Leaders Division, consisting of Illinois, Indiana, Ohio State, Penn State, Purdue, and Wisconsin would be the stronger of the two. Ohio State is the preeminent program in the conference, while Penn State and Wisconsin have shared the conference crown with the Buckeyes twice in the last three seasons. However, when we look at how the teams have fared versus teams slated to be in the opposite division over the past four seasons, we can see that outside of Ohio State, the Legends have held their own against the Leaders. 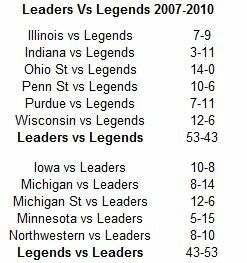 The Leaders do have a 10-game edge in games played between what will soon be the two divisions since 2007, but if we remove Ohio State and their pristine, unblemished record, the Legends are actually 43-39 against the Leaders. Combine with that the fact that the Legends will be adding a Nebraska team that has won their division in the Big 12 the past two seasons, and the divisions are much more balanced than they appear at first glance. After reviewing the ACC last week, we now turn our attention to the Big East. The Big East ended the 2010 season without a single team ranked in the AP Poll, and also had the indignity of having its champion lose to Temple. if you're interested in mocking me, here's the link to last year's Big East post. As usual, this first paragraph will explain how SDPI is calculated. So if you want the meat of this article skip on down. 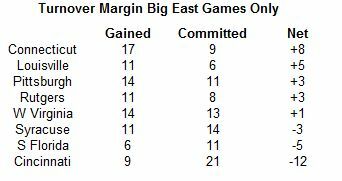 In the 2010 Big East regular season, conference play only, the average Big East team gained and allowed 2280 yards. The standard deviation for yards gained (offense) was 371.84 yards. The standard deviation for yards allowed (defense) was 433.51 yards. Louisville gained 2203 yards and allowed 2009 yards. Their offensive SDPI was -0.21 = [(2203-2280)/371.84]. Their defensive SDPI was 0.63 = [(2280-2009)/433.51]. Their total SDPI was 0.42. This number ranked 4th in the Big East. Here are the 2010 Big East standings. Now here are the 2010 Big East SDPI standings. The standings are sorted by total SDPI with ranking for each category (out of 8 teams) in parentheses. Connecticut became one of the most unlikely BCS bowl participants ever by winning their final five league games after an 0-2 start and ending the reign of two-time defensing champ Cincinnati. Pittsburgh and West Virginia were bridesmaids once again. Beginning in 2008, both the Mountaineers and Panthers have finished either tied for second or first place, but have yet to play in a BCS bowl. Based on SDPI, Cincinnati should have been one of the top teams in the Big East. The Bearcats boasted the top-ranked offense in the conference, and despite their poor showing on the defensive end, one would have expected them to at least finish with a winning record. Unfortunately for the kings of the Queen City, the Bearcats had a proclivity for turning the ball over and failed in their endeavor to take the ball away from their opponents. 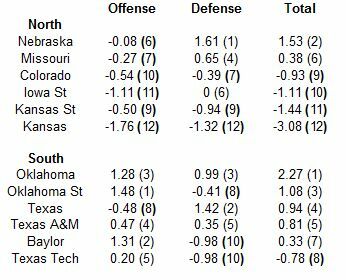 The Bearcats committed the most turnovers in the conference by far (averaging three per game) and forced the second fewest. When that happens even the best of teams will struggle to win games, and coupled with the Bearcats other defensive inefficiencies, it made for a long season for the defending Big East champs. Obviously the team with the biggest discrepancy between their conference record and their SDPI numbers was league champion Connecticut. The Huskies won the Big East, but were statistically one of the weakest teams in the conference, and became arguably the weakest team to ever qualify for a BCS bowl. How did the Huskies do it? Remember that turnover chart earlier? If you don't, scroll up a few inches. The Huskies forced the most turnovers in the conference and boasted the league's best turnover margin. I wanted to look a closer at the dream season Connecticut experienced. The Huskies lost their first two league games and looked as if they could miss out on the postseason entirely. However, they won their final five games, beating co-champs West Virginia and Pittsburgh along the way to grab the tiebreaker advantage. What changed in the final five games versus the first two? As you can see, the Huskies were outgained by over 160 yards per game in their first two league losses. However, they didn't suddenly become dominant in their final five games. While they did improve on both sides of the ball, they were still outgained by about 55 yards per game over their five-game winning streak. The difference was two-fold. 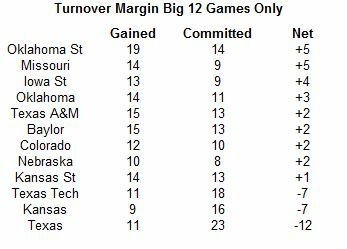 Turnovers and close games. The Huskies did not force a single turnover in their first two games, but they forced 17 in their final five games! The randomness and vagaries of close games also contributed to their success. The Huskies lost their league opener against Rutgers by three points. After that game, the Huskies owned crunch time, beating West Virginia, Pittsburgh, and South Florida each by three points or fewer. For the Bearcats, it was either feast or famine on offense. In their games against the top-3 Big East defenses (West Virginia, Pitt, and Syracuse), the Bearcats averaged only 274 yards and 9 points per game. In their other four league games, they averaged 526 yards and 38 points per game. The Orange, Huskies, and Bulls were all clustered close together near the bottom of the Big East in terms of offensive firepower, with the Orange ranking below the other two. Only one Big East team, Pittsburgh, topped 300 yards against the Mountaineer defense. It really was a shame the offense could not pull their weight. The Mountaineers lost two conference games when they allowed 19 and 16 points respectively. The Scarlet Knights opened league play well enough, beating eventual champ Connecticut and holding them to just 284 yards of offense. Unfortunately, they would go on to lose their last six league games while allowing an average of 456 yards per game. Can you believe this November will mark five years since Rutgers burst onto the national scene with their program defining Thursday night upset of Louisville? My, how time flies. That win marked Rutgers first ever foray into the AP top-10 and though they failed to capitalize on the big win with a BCS bowl appearance, the Knights finished the season 11-2 and ranked number 12 in the nation. Many observers probably believed (and rightfully so) that Rutgers was poised to contend for the Big East crown for the next several seasons. However, in the four seasons after their 2006 breakthrough, the Knights have gone a rather pedestrian 12-16 against their conference foes and have failed to finish in the final polls, much less compete for a conference title (save for 2008 when they finished 5-2, one game back of Cincinnati). One reason for their failure to stay relevant since their shining moment on national television has been the decline of their running game. You may remember in 2006, the Knights had the services of a pair of future NFL running backs in Brian Leonard and Ray Rice. Rice was still toting the rock in 2007, but in the three seasons since his departure, the Knights have gone from an average running team, to one that is among the worst in the Big East. As Connecticut proved in 2010, the Big East is always one of the more wide-open BCS conference races in the nation. If the Knights are to do what many expected and claim a conference crown, they must get more production from their ground game.